WE ARE VERY proud of Layla, who today passed her ‘Barky Dogs Reactivity’ course. Well done to Kez, who has been taking her on Sunday mornings, and very grateful thanks to Sheila from Baddogz. 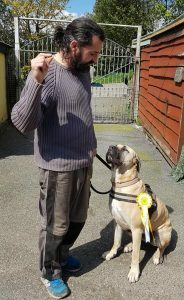 Despite being the perfect companion and consummate home buddy Layla has had a tendency to be a bit of a diva on the end of a lead, this can make life a bit tricky for the poor soul on the other end of a 50k+ Boerboel. 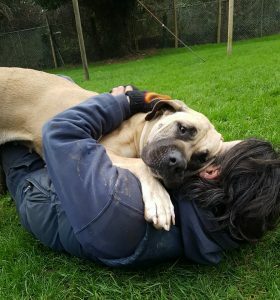 She is more steady now but Layla will need calm, confident and considerate owners to continue the training and they will be rewarded with an absolute star of a dog. She will be a fabulous pet for her new family. They just need to find her first.